Cookies and ice cream!! We love ‘em, but we sure can’t eat ‘em… at least not very often if we’re watching our weight. Here’s a way to enjoy them without the calories. 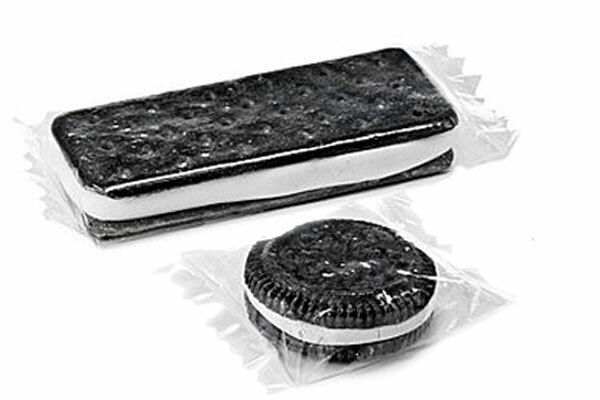 Uncommon Goods, one of my favorite online shopping sites, is offering pewter snack sculptures in the shapes of an OREO look-alike and a good-enough-to-eat ice cream sandwich bar. These treats are life size and hand cast from pewter in New York City. Hungry for more? Check out the copper and pewter crackers, the porcelain French fry pouch, the pewter fortune cookies. Buy ‘em all, and you’ll have a snack-tastic centerpiece for your dining table! Entry filed under: coping strategies. Tags: fun and funky. Clean Eating in the Friendly Skies (or on the ground in between)	Don’t belong to a gym? Don’t worry!